This website provides information about myself and my major interest, Amateur Radio. In addition, you will be updated with the latest current weather data at my home in Bergenfield, NJ. Welcome, look around and send me an email with any comments or suggestions. I have been interested in electronics and radio most of my life and pursued a career in telecommunications. 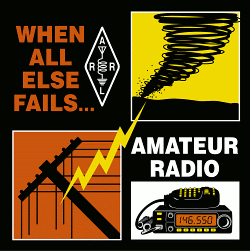 However, with raising a family and building a career I did not come to Amateur Radio until later in life. One afternoon about 25 years ago my then 10 year old son and I were out for a hike and came upon a "Ham" operating portable and engaged in a VHF contest. My son asked a few questions and immediately showed an interest. I offered to get involved if he understood it took commitment, he agreed and we began our studies. Several months later we emerged with our first "tickets" (FCC license - a very proud father) and off we went, full speed ahead into the world of Amateur Radio. Of course, I immediately rekindled my interest in radio from my youth and have progressed through the ranks and currently hold a FCC Amateur Extra Class license and a FCC Commercial General Radiotelephone Operators license. Previous Amateur calls were KB2WKI and KG2JA. My son, Dave KB2WKJ, holds an Amateur General Class license and continues to explore the world of radio. I've been married to a wonderful woman, Jodi, for over 45 years who has put up with me and my hobbies and graciously allowed me to collect radios and erect all the antennas you see here. This site gives me a chance to thank her publicly for her understanding and support! The aim of this project is to reliably and inexpensively link Amateur Radio systems without the use of RF, leased, or satellite backbone links but still keep a RF radio transceiver as the primary connection to the system. The IRLP system, designed by David Cameron VE7LTD, uses Voice-Over-IP (VoIP) custom software and hardware. Coupled with the power of the Internet, IRLP links an Amateur Radio station to the world in a simple, reliable and cost effective manner. IRLP operates a network of dedicated servers and nodes offering very stable worldwide voice communications between hundreds of towns and cities. All this with unsurpassed uptimes and the full dynamic range of telephone quality audio. My node numbers are IRLP 4676/8072 and EchoLink 517996/303862. IRLP 4676 radiates from atop Tower 2 on the frequency of 223.600 megahertz, simplex (pl 141.3). The Alinco DR-235T FM rig is connected to a Micro-Node (standalone) running the Linux/Centos 4.8 operating system (for stability) customized with IRLP scripts. The 1.25cm (222MHz) band is an excellent segment of the Amateur frequency spectrum with many of the fine characteristics of 2m/70cm. However, it is underutilized and therefore an excellent spot to place a simplex node out of the congestion of 2 meters (146MHz) or 70cm (440MHz). IRLP 8072 is a mobile Nano-Node and is utilized via an iPhone "hotspot" or external WiFi for access away from IRLP/Echolink access. RF access to the Nano-Node is via 446.875 (100.0 pl, simplex) Email me for more information regarding IRLP/Micro-Node technology. I invite you to access and try out the system via my node. Let me know what you think of this technology and drop me an email if you have any questions. However, before you jump in, be certain you understand the acceptable use policies of this network and, of course, the basic operating principles. Please check out the IRLP Guidelines before you access the system. Remember, this is still Amateur Radio, you need (an Amateur FCC license, of course) to RF link to my node or others to utilize this system!